As do most people, I suspect, I’ve always used the keyboard that came with my computer. The first computer I ever used on a regular basis belonged to my tech-savvy grandfather. I’d play games on it during the weekends when my family visited, until one summer when he upgraded and my folks inherited the hand-me-down IBM. Many years and a few family computers later, I bought my own computer: a Dell laptop that went off to college with me. After the Dell was my first Mac, the iconic 12-inch PowerBook G4. A few years later, in the spring of 2007, I bought a Mac Pro. The Mac Pro is a beast of a machine. So beastly, in fact, that it doesn’t come with a single peripheral attachment — you have to pick out your own monitor, keyboard, mouse, and anything else you may need. And so, for the first time, I got to pick my own keyboard. At the time, I didn’t know any better and so I went with an off-the-shelf Bluetooth white plastic Apple Pro Keyboard. The white and clear Apple Pro Keyboard was perhaps the worst keyboard ever designed in California. It was dull and soft to type on, it was neither quiet nor loud, and it had a see-through casing to display all the food crumbs, wrist hairs, and dead bugs that fell between the keys. In the fall of 2007, Apple redesigned their keyboards to the new slim aluminum keyboards they still sell today. I eventually bought one of those to go with my Mac Pro. Though the thinness of the keyboard made it seem to me like a less-serious keyboard for folks who type a lot, it looked extremely cool. And we all know how important it is to have a clean and hip-looking desk. It turns out, however, that Apple’s slim aluminum keyboard is quite nice to type on. I’ve been typing on them in some fashion or another ever since 2007. In addition to the full-sized USB version I bought to replace my clear Apple Pro Keyboard, I also bought one in Bluetooth flavor to pair with my original iPad, and the MacBook Air I bought last summer has the slim chicklet-style keyboard built in. I think I might like a better keyboard. I’ve never thought anything bad about the slim Apple bluetooth keyboard I use, but recently I spent some time using my cousin’s mechanical keyboard and there was a completely different feel to it. I’ve never been a keyboard snob, but considering my profession, perhaps the time to get snobby about keyboards has come. As someone who writes for a living it befuddles me why I never thought to research a proper keyboard. As a computer-nerd-slash-writer, I am always looking and advocating for the right tools. But for years, I have always equated “writing tools” with “software” — I own more text editors than I have fingers to type with — but it never dawned on me until recently that a good keyboard could be equally as important as a good text editor. I own a dozen different writing applications, a programming application or two, an email application, and a blog-posting application. And what do they all have in common? They all get typed into via a single, solitary device: my keyboard. A month ago I ordered a Das Keyboard for my Mac. Not because I was dissatisfied with my beautiful and trusty Apple keyboard; rather, I needed to know if life could be better with a bigger, louder, and uglier keyboard. When I placed the order, I had no idea what I was getting into. Owning a mechanical keyboard is like owning a Jeep Wrangler — there is an unspoken fraternity amongst owners that others don’t quite “get” and which I honestly don’t think I can explain in a blog post of only a few thousand words. What was so exciting? Merely the elimination of all drudgery, except for the fundamental drudgery of figuring out what to say, from the business of writing. When using a mechanical keyboard you don’t just see your words appear on the screen as you type them, you also feel and hear them. A mechanical keyboard engages all the senses but smell and taste. Which is why you should always type with a hot coffee at your side. The sound, size, and durability of a mechanical keyboard make it a device to be reckoned with. It is a wholly different keyboard than the slim Apple ones, but that is not to say I have been turned off to the slim Apple keyboard. When I’m working on my iPad (using the bluetooth keyboard) or my MacBook Air’s built-in keyboard, I still type quickly and comfortably. Das Keyboard Professional Model S: This is the keyboard that I started with. I pre-ordered one a few months ago for $113, and it arrived about a month ago. The Das Keyboards begin shipping on Friday, April 27 for $133. Apple Extended Keyboard II: Bought on eBay, the keyboard itself is circa 1990, uses Alps switches, was not made in Mexico, and cost me $31.45 shipped. I also had to purchase an ADB cable for $8.35 and a Griffn iMate ADB to USB adapter for $25. Total cost: $64.80. Matias Tactile Pro 3: A well-known 3rd-party keyboard that bills itself as the modern version of the Apple Extended II. It seemed unfair to write a review of Apple mechanical keyboards and not include the Matias Tactile Pro. These sell for $149, but Matias was kind and generous enough to send me a review unit. Further down I have written more in-depth about the sound, feel, and overall typing experience of each of these three keyboards. But, before we get into that, let’s first check out some side-by-side statistics to give context for the general differences between these three keyboards. They say that using a mechanical keyboard doesn’t necessarily make you a more productive typist. But based on the typing tests I took it would appear that a mechanical keyboard does improve your actual typing productivity. I took this typing test to measure the speed and accuracy of my typing. As you can see, I typed the slowest and the least accurate on the Apple slim aluminum chicklet-style keyboard that I’ve been using for over 4 years. My fastest and most accurate test was performed on the Das Keyboard. I typed a staggering 15 words-per-minute faster on my Das Keyboard than on my Apple slim keyboard, and at least 10 words-per-minute faster than on the Matias or the Apple Extended keyboards. And the words typed on the Das were more accurate. The difference in speed adds up to at least 900 additional words (with fewer typos) for every hour of typing. Of course, nobody types at a constant rate, especially when the typing is creative. But nevertheless. Considering I spend nearly 6 hours a day at my computer, mostly typing, that difference in speed and accuracy is not insignificant. Not all clicky keyboards are noisy, but I greatly enjoy the sound of the mechanical keyboards. At first I was timid about the noise coming from my home office, but I have since become acclimated and comfortable with it. Even proud of it. Each keyboard I tried has a different sound. The Apple Extended II is the quietest and has the lowest tone of clack. The Tactile Pro 3 is the loudest and has a hollow ring that accompanies the clicks of the keys (more on this later). And the Das Keyboard has a crisp higher-pitched click. Of the three I prefer the sound of the Das Keyboard the best. But, if I could mix and match, I would place the letter keys of the Das with the spacebar of the Apple Extended II and the Backspace of the Tactile Pro. Sorry, your browser doesn’t support this audio type. As I began researching mechanical keyboards and the different types of switches they use, I had no idea the rabbit hole I was crawling into. For brevity’s sake, I’m only going to share a little bit about the differences between the switches found in the 3 keyboards I have. For most people it’s all about the feel. With the keyboard you’re typing on right now you’ve got to press the key all the way down to the bottom to get it to register. This wastes a lot of energy and causes fatigue, as most of your effort is spent pushing against a solid piece of plastic. Mechanical keyswitches are designed so that they register before you bottom out, so you only need to apply as much force as is necessary to actuate it, not wasting any. And with as many different types of switches as there are you can pick and choose which one you’re the most comfortable with, as each one has a different feel to it. And most people who try one can never go back to using rubber domes, as they realize just how “mushy” they really feel. As I quickly discovered, not all mechanical key switches sound or feel the same. Not only are there many different designs of switches, but some are better for typing, some are better for gaming, some have a slight snap-resistance that provides a tactile feedback as you press the key, and some give off a noisy click or clack. The Das Keyboard uses blue Cherry MX switches. The blue Cherry MX switches have a very pronounced 2-stage travel with a very audible click that happens upon activation. The total travel of a Cherry Blue MX switch is 4mm; the switch actuates and clicks half-way down at the 2mm mark. This two-stage click is not nearly as pronounced on the ALPS switches, and it is this pronounced two-stage click that leads many people to consider the blue Cherry MX switches to be the best for typing. They have low resistance and a very noticeable tactical “bump” or “click” that can easily be felt when typing. You don’t have to bottom out the key to get it to activate. Once you’ve pressed past the “click” at the 2mm mark, that is when the key switch activates and the keystroke is registered by the computer. It’s hard to explain the tactile sensation of typing on the Das Keyboard compared to using the Apple Extended or the Tactile Pro. I would say that because of the pronounced 2-stage switch, the Das has a more defined tactile feel, is less work, and is more enjoyable to type on. ALPS switches are not only a type of switch, but also a brand. Tokyo-based Alps Electric Co., Ltd. makes the switches. You may have also heard of their brand of car audio gear: Alpine. The Apple Extended Keyboard uses white Alps switches, as does the Tactile Pro. However, the Apple Extended Keyboard uses what is known as “Complicated ALPS” switches, while the Tactile Pro uses “Simplified AlPS.” This is because the complicated switches are no longer in production. Over time, the complicated ALPS switches can be known to generate resistance because of dust and other elements that can build up within the switch. 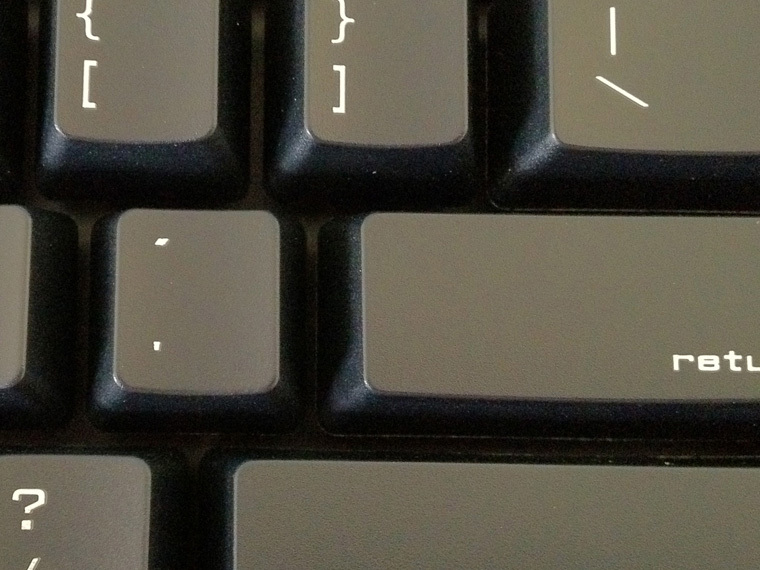 The Simplified ALPS switches, which the Tactile Pro uses, are less prone to this. Based on my typing experience with both the Tactile Pro and the Apple Extended II, the Simplified ALPS switches give a bit more resistance than the older Complicated switches. The newer ones seem to have a more pronounced “click” or initial force of resistance. They are also louder. This is not necessarily a bad thing — one of the things that makes mechanical keyboards so great for typing is their click and their clack. Before you’ve even typed a word, the first thing you notice about the Apple Extended Keyboard II is how huge it is. The AEK is the widest keyboard of the bunch. It measures just wider than 18.5 inches. My son, Noah, was 19.5 inches when he was born. He could have taken a nap on the Apple Extended Keyboard. Who knows, he may have written something clever in the process. With the AEK on my desk, my 23-inch Apple Cinema Display, which measures 21-inches across, now seems tinier than it used to. When I used the thin and sleek Apple Bluetooth keyboard, the cinema display seemed so large in contrast. With the Apple Extended Keyboard in front of the monitor, the screen now has a peer it must reckon with. Next, you realize that the Home Row markers are on the “D” and the “K” as opposed to the “F” and the “J”. The latter is now the de facto standard and it takes some time to acclimate to the feel of the markers being under my two middle fingers rather than my two pointer fingers. Lastly, the Apple Extended II uses an ADB cable. The keyboard I bought off eBay didn’t come with the cable, so I had to buy an ADB cable separately ($8) along with a Griffin iMate (an ADB to USB adapter that cost me another $25 on eBay). I had been typing on my Das Keyboard for nearly two weeks before the Apple Extended II arrived. I expected it to sound and feel nearly the same as the Das Keyboard, but the complicated white ALPS switches are quite different than the blue Cherry MX switches. It is true that they are both clicky mechanical keyboards, but if you did not know that and you were only to type on each of these you would not classify them as being the same type of keyboard. My Apple Extended II feels softer and sounds quieter than both other mechanical keyboards I have here. If you’re listening to the different audio tracks I’ve recorded, the MP3s may sound a bit deceiving. Sitting here, in my office, the Apple Extended Keyboard II is the quietest of the bunch. It is certainly not quiet — but it does not have the same high-pitched click. The Das is like a snap, the AEK is like a clap. The AEK has more bass to it, and the sound is more muted. Again, I don’t know if the stark differences are because the ALPS switches in my Apple Extended II are used and 22 years old, or because they are the complicated ALPS switches. Perhaps I will never know because I don’t feel compelled to invest nearly $200 for a “brand new” 22-year-old Apple keyboard. The $32-find I got on eBay is simply the best one that was guaranteed to work and which was not assembled in Mexico. The Matias Tactile Pro bills itself as the modern version of the Apple Extended Keyboard II. Though the look of the Tactile Pro is patterned after the design of black-keyed Apple Pro Keyboard circa 2000, it uses white ALPS switches, akin to the 1990-era Apple Extended and Extended II keyboards. But the switches are not the exact same because those used in the Apple Extended are no longer made today. The key switches on the Tactile Pro feel very different than those on my Apple Extended Keyboard II. The click-down on the Matias is much more pronounced than on the AEK II. Though I am not fully certain that this is because of the difference in switches rather than the age of my Apple Extended keyboard, the reviews I read online about the differences between the complicated and the simplified ALPS switches did seem to be concurrent with my experience. Typing on the Tactile Pro is bittersweet for me. The tactile feedback of the key switches is quite pleasant, and there is a firm resistance within the switches that gives the keyboard a sturdy and hearty feel. I like the slightly higher resistance that the Tactile Pro gives. Moreover, the sound of the Tactile Pro when typing is much louder than the Apple Extended II. I like the louder volume, but unfortunately it has a hollow sound to it that seems incongruous with the sturdiness of the switches. Additionally, there is a ringing that echoes around in the chassis of the keyboard itself. After typing on the Matias for two days, as much as I liked the tactile feel of it, the sound was constantly a distraction. I asked Matias about the ring, and was informed that the noise comes from the springs in the ALPS key switches. Matias tells me they are advancing the key switches to remove the ringing in a future version of the Tactile Pro. Also, the chassis design of the original Tactile Pro is built in such a way that the spring ring is not nearly as audible. This new model of the Das, which has the keys mapped out especially for a Mac, seems to be re-kindling the interest in mechanical keyboards. It is the first mechanical keyboard I got, and before that the first (and only) mechanical keyboard I had ever used was my cousin’s Adesso MKB-125B. Both the Das and the Adesso use the blue Cherry MX switches. It was through using the Adesso that I first began considering upgrading my typing tool. Unfortunately, the Das (like the other 2 keyboards I tested) is big, bulky, and generally an eye sore. In fact, of the few other reviews I’ve read about it, the general consensus is: it’s ugly, but it’s great to type on. The clickety-clack quickly makes up for the aesthetic sacrifice by telling everyone within earshot that you are getting some serious work done. The aesthetics of mechanical keyboards today baffle me. Just because it has mechanical switches, which were especially common from keyboards of the ‘80s and ‘90s, doesn’t mean it should also look like it’s been rescued from 20 years ago. In addition to being the ugliest of the three mechanical keyboards currently in my office, the typeface used on the key caps of the Das is horrendous. Perhaps the worst offender is the single-quote / double-quote key, which rests just to the left of Return. At a glance, it looks like a period and a single-quote. However, the Das Keyboard has two great things going for it. More than the other two keyboards, I prefer the tactile feel of the blue Cherry MX switches and the audio click of the Das. Since you don’t buy a mechanical keyboard for its aesthetics, for those looking to get a clicky keyboard, this is the one I would recommend. Though the Das Keyboard for Mac has custom modifier key commands drawn onto its function keys, those special modifier keys aren’t recognized by OS X. The “F14” and “F15” keys work to dim and brighten the display (rather than the traditional F1 and F2), but in order to control the previous track, next track, play/pause, and volume up/down/mute you have to press the Function Key which is awkwardly placed under the right-side Shift Key. Since the System doesn’t recognize the Das Keyboard’s special keys, you can’t tell it to treat F1 like it would on an Apple keyboard without pressing that Function key. For the life of me, I don’t know why this is, but it just is. Fortunately Keyboard Maestro is a keyboard’s best friend. A little bit of fiddling with the Macros and I was successfully able to map F6 all the way through F11 to act as the blue markings say they should act. 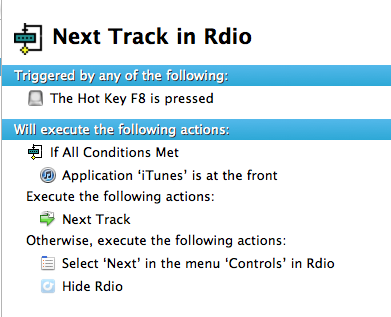 Moreover, since I use Rdio as my tunes source, I hacked together a rather clever if/else macro that allows me to control iTunes if I’m in iTunes, but otherwise to default to controlling Rdio from anywhere else in OS X. With the Keyboard Maestro hacks in place, you may have trouble using your normal modifier keys on your MacBook Air (assuming you use your Das Keyboard with your laptop in clamshell mode). If so, check out this cool little utility called Function Flip. After a month of using and testing the three most popular clicky keyboards for Mac, I am extremely glad I jumped into these waters. The sound and the feel of a clicky keyboard only takes a few days to get used to, and what follows is this intense feeling of productivity that now accompanies anything I type. Something I like about mechanical keyboards is that each key has its own unique sound and feel. You could tell how many words someone types, and how many in-line typos they fix, simply by listening. Space Bar, Backspace, Return, and the letters — each produce a unique sound and have their own tactile feel. There is variety when typing on a mechanical keyboard. All of these keyboards are just so darn loud that there’s no ambiguity as to if I am typing or not — I know it, Anna knows it, and heck, the neighbors probably know it. When I set out to type a sentence, I am committed — it is like the typing equivalent of writing with ink. If you too want to adorn your desk with an ugly keyboard — one with a loud personality and which increases typing productivity — then I recommend the Das Keyboard. I prefer both the tactile feel and the sound of the blue Cherry MX switches, and though I find the Das to be the ugliest of the bunch, a serious typist knows you shouldn’t be looking at your keyboard while you’re typing. Update: See also the review of tenkeless clicky keyboards.